Sweet Pea is 27 months old. 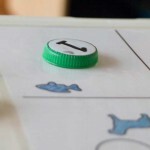 From: I found these Bottle Cap Letters on Carissa’s Tools for Tot’s page. 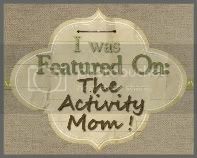 I got the idea to use Mod Podge on them from this post at Heather’s Eager Little Mind blog. Several washed and dried caps from gallons of milk. 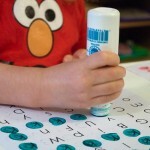 2-3 Milk Cap Alphabet Sheets (.pdf file requires Foxit or Adobe Acrobat). Elmo Big Bird and Bert Nameplates (.pdf file requires Foxit or Adobe Acrobat). Abby Cookie Zoe Ernie Nameplates (.pdf file requires Foxit or Adobe Acrobat). A laminator or press and seal lamination pockets. Basket or bowl for storing the milk cap letters. Cut the nameplates into individual rectangular strips. Note that name “Big Bird” should all be on one strip. Apply a sticker or glue a picture of each Sesame Street character to the left hand side of the correct nameplate. Laminate and cut out each nameplate. Round off the corners of the laminated nameplates if they are sharp. Decoupage the letters to the milk caps. Cut out the letters you wish to use from the letter template sheet. You don’t need to do all of the letters, just the ones you will be using on the nameplates you create. Paint a thin layer of Mod Podge on the top of one milk cap and set aside. Paint a thin layer of Mod Podge on the back of one of the letters. Stick the letter to the top of the milk cap and paint a thin layer of Mod Podge over the top. Let the letters dry overnight and then put them in a basket. 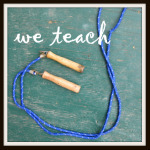 Present the activity to your tot. Select which nameplate you are going to use first and find all of the milk cap letters that will be used with it. Leave the rest of the letters in the basket. 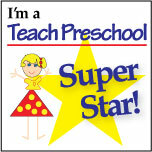 Put the selected nameplate in front of your tot. 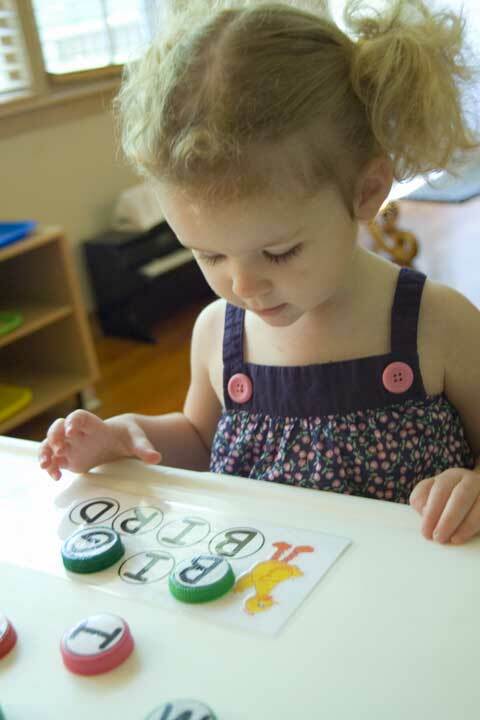 Randomly put the milk cap letters that go with that nameplate on the table within your tot’s reach. Point to the first letter on the nameplate (“E” in ELMO for example) and say, “We need to find the “E” that goes here. Pick up the correct letter and put it on the nameplate. 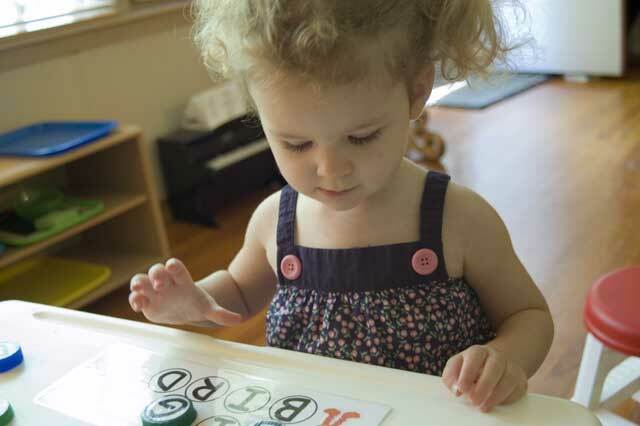 If your tot needs extra help, ask them to find the next letter (“Can you find an L?”) and so on until they understand the game. Observations: Sweet Pea was, of course, thrilled to do anything that involved her beloved Elmo. However she only briefly played with this the first time I introduced it. She was very interested in the Sesame Street characters, but didn’t really want me to show her what to do with the letters. We have played with these a few times since then and she has started to enjoy matching up the letters. She spends longer with them each time and I think really likes them now. We also made personalized nameplates for Sweet Pea and some of her family members. Sweet Pea loves seeing photos of people she knows so this was a big hit too. The blogs I linked at the beginning of this post have more of an explanation on how to make your own customized ones if you are interested in that. 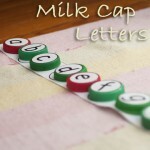 Notes from the Trenches: Some people have been having trouble with the milk cap letters sticking together. 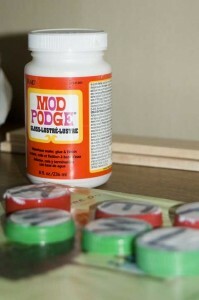 Someone told me that the Hardcoat Mod Podge doesn’t have that problem, but I haven’t tested it. You can also spray the letters with a a clear acrylic sealer on top of the Modge Podge if you are having a problem with stickiness. 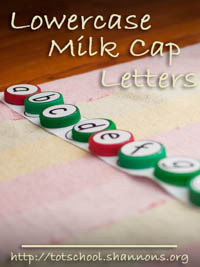 I’ve been making the milk cap letters in batches. 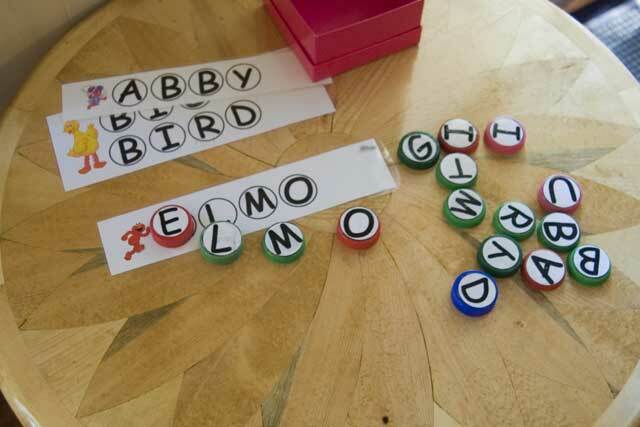 I did about 8 letters to start for ELMO and ABBY and then made up another set of letters after I had saved up enough to complete a couple more nameplates. I recommend making duplicate letters if you will be using them for more than one nameplate. For example, you should make 2 of the letter E if you have created both the ELMO and COOKIE nameplates. Sweet Pea preferred insisted on keeping all the milk cap letters on every nameplates. I couldn’t get her to remove the E from ELMO to use on COOKIE. At the begining I tried just using a basket of all the letters and letting Sweet Pea search through them to match up with the selected nameplate, but this was too hard for her. When first starting out, I suggest only presenting the letters that can go on a particular nameplate. As usual, this activity had an unexpected ending. After playing with the nameplates for a bit, Sweet Pea then grabbed the letter “D”, jumped up and started chasing our dog around the room with it. 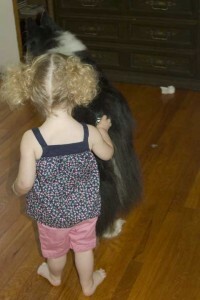 She kept repeating “D” “Duh Duh” Dog” as she attempted stick the letter onto our poor collie. I snapped this photo shortly before I had to intervene. I keep thinking of making that game, but haven’t yet. I’ve been collecting milk caps for ages. I need to just make the plunge and make the game. 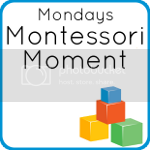 What a great spin on the milk cap game! I have been saving and saving and SAVING milk caps to do some with names for Sunshine! Thanks for the templates! 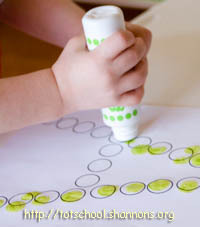 What a CUTE activity; I can’t wait to use this once my little girl is ready. And, the “trying to put ‘D’ on the dog” activity was HILARIOUS! LOL. Love this! I made these recently for my daughter, but used family members’ pictures. She would LOVE the Sesame Street twist! I love checking your blog for new ideas! We do name puzzles with milk caps too, but mine are not nearly as great as yours! Very creative! Oh thank you so much for sharing these! I made 2 batches tonight since I have 9 children I am homeschooling and 3 of them are pre readers. They were all excited when I began to make these. I cant wait to add these to their daily schoolwork. Do you have any number templets like the letters? I loved the font of the letters. Very cheerful!! Thank you!!! I’m so happy that you like these. I love hearing that they have been helpful. I don’t have any number templates yet, but I do plan on making them. I’ll probably get around too it in November. LOL! I’m responding to your post on my blog, I think numbers is a great idea, and I was going to do lowercase letters too since my 3yr old is getting the uppercase letters pretty well down. She loves this activity though and so I’ve been making a sheet per letter! 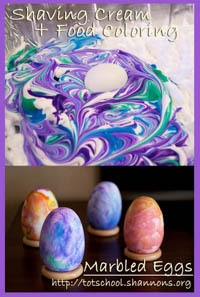 I’m learning about Montessori and how to implement the strategies into my home for my children and these look wonderful. The only thing I would mention is to make the vowels red. I plan on printing these out and using them for my children. Thanks! I made a couple of these with my sons’ names and pictures on them a couple months ago after seeing your blog on pinterest. My 3 year old loves them! I’m wanting to make some with lower case letters as well. Do you have a template for the lower case letters? They are not on the site yet, but I expect to do a post about them soon and will include a template. Is there a template that enables you to create your own wordcards? You have some wonderful ideas. Thanks. I’m sorry, but I do not have a template for creating the milk cap word cards. Unfortuantly I can’t even locate my original uppercase milk cap files. I do have a worksheet that I recently created of lowercase letters, but it is was made in Adobe Illustrator (.ai format). Would you be able to use that? If so, I can email it to you. However, my best suggestion would be to print out several copies of the alphabet sheets (http://totschool.shannons.org/wp-content/uploads/2009/07/MilkCapLettersTemplate.pdf), cut out the letters for the words you want and tape them down to another piece of paper. If you photocopied (or scanned and printed) that sheet of paper, I think it would work right. Can you tell me what font you used to create the letters? I have made a set for Dora and want to make several more with other characters but I want to be able to reuse the letters that I have for Sesame. Thanks!! For the uppercase and lower case milk cap letters and Sesame Street nameplates I used the (much maligned) Comic Sans font, mostly because it used the more commonly taught version of the letter “a”. Do you remember what SIZE font? I’m in the middle of making the letters, and wanted to make personalized name plates too. Thanks for all the great resources!! I created those sheets in photoshop, and I flattened the layers. I don’t have access to the original unrasterized font anymore. I did some compassion and I think that the letters were very close to 100 pt. If I remember correctly, I may have had to make some of them (“W”) a little bit smaller to fit inside the circle though. Hope that helps! Take a picture of your child and other family members. Make Name plates with the pictures on them so the child can start recognizing family member names. Dont forget to make the letter tiles to match!! Great idea and I think writing the letters with Sharpie will work just fine. (As a side note, I’ve found that the Bic brand Mark-It pens stay on slick / plastic surfaces much better than Sharpie.